Rocketbirds: Hardboiled Chicken Now Available on Steam! You know what day it is? It’s Monday again and that can mean only one thing here at GodisaGeek: It’s time for another edition of Mobile Monday, the article where we take a look at four mobile games and let you know if they’re worth your time and money. This week, to celebrate the launch of PlayStation Mobile, we’re taking a look at Hungry Giraffe from Laughing Jackal, Aqua Kitty from Tikipod, and Fuel Tiracas and Beats Slider from FuturLab. Read on to find the full reviews of each game, but don’t forget to come back next week for more Mobile Monday reviews. While you’re here, if you have played any of the games listed, or even just want to come back once you’ve had a go to let us know how you got on, we’d love to hear from you in the comment box at the bottom of the page. Get downloading and get playing! All of this week’s titles can be found on the PlayStation Network’s brand new PlayStation Mobile store. Go and check them out now! There’s a lot to be said for simplicity, especially in mobile games. Think back to how many accumulated hours you lost to Snake on your Nokia 8210 (remember those?) back in “the day”, and remember the unencumbered joy of only having to memorise what up, down, left and right did. Of course, it’s all well and good on a mobile when you need something to dip into for a five minute bus ride or a spell on the porcelain perch, but you wouldn’t necessarily want to subject yourself to such a simple exercise for a protracted length of time. Which is the quandary that arises when considering the new PlayStation Mobile games, many of which are ports from Android and iOS. Take Hungry Giraffe as an example: The game couldn’t be simpler. You guide the titular greedy herbivore on an upwards journey, eating everything in sight as you go. The more you eat, the higher you go; the higher you go, the longer his bendy neck gets, until you reach a predetermined milestone and enter a new stage, wherein you then repeat what you did in the last stage only a bit faster. Various foods have various effects: pills reverse your left / right controls, green bottles splash paint over the screen to temporarily obscure your vision and red hot chilli peppers give you a speed boost. Conversely, eating dumbbells will cause you to struggle and eventually fall back down, and when you hit the bottom of the screen it’s game over. There are no tactics beyond collecting and using yellow hard-hats to counteract the effects of the numerous anvils that litter each stage and daze you when you clump into them. It’s all just so simple and repetitive that the challenge comes purely from the giraffe’s frustrating habit of giving up if you don’t gobble enough food quickly enough. Once he starts to falter, it’s as good as over since getting him going again is nigh impossible. Graphically it looks pretty enough, there’s just nowhere near enough variety or imagination to keep you playing for more than three minutes at a time. The advancing stages vary only by backdrop, and the music remains monotonous throughout. The only saving grace of Hungry Giraffe is that it has a certain addictive charm that will see you wandering back to it now and then for something to do when you’ve got a few minutes free. You just won’t do it very often. Sony has finally released its PlayStation Mobile store after years of talking about it, and with it we’ve got quite a few games that would normally be suited more towards a mobile device, and if you’ve got certain Sony smartphones you can still play them on there, but thanks to the PlayStation Vita you can play these games as games should be played; with controls! One of these newly released PlayStation Mobile games is Aqua Kitty, a side-scrolling bullet hell style of game from Tikipod, and, let me be brief, if this is the standard that Sony are aiming for with this new venture, we could be in for something special. 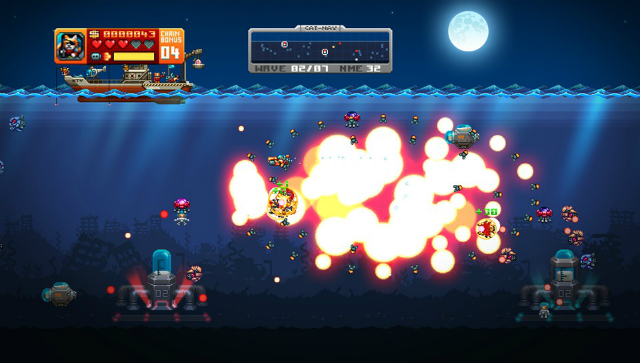 Aqua Kitty is a side-scrolling shooter where the player plays as the titular Aqua Kitty, a small cat in a submersible that has to fire upon the oncoming waves of enemies in an attempt to slow down their advances toward their friends that are manning the milk reservoirs at the bottom of the sea. The gameplay is pretty self explanatory and most people will be able to get on with the task at hand in no time, shooting down enemies left, right and centre, saving kitties, saving the milk and generally just being awesome. Once you clear the whole area of enemies you’ll be on to the next level to do it all over again. The life of an Aqua Kitty never stops. If playing through the levels is too mundane for you, and you want to try your hand at something a little bit more challenging, then you can always delve into the Infinite mode. 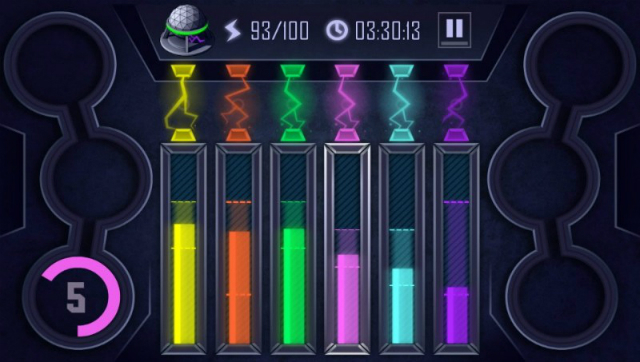 In this mode, there isn’t a set number of waves as there is in the other levels of the game, instead you’ve just got to see how long you can last. The longer you manage to stay alive, the greater your high score will be, and that’s all we really want at the end of the day. There’s no multiplayer in Aqua Kitty but there’s nothing stopping you from starting up Infinite mode, placing a score, then passing your device to a friend to get them to try and beat it. I can only speak for the controls on the PlayStation Vita, but they all seem well thought out and implemented, with the left analog stick controlling your submersible, the X button controlling the shooting, the Square button providing you with some (often much needed) special abilities and the bumper buttons being used to turn your craft to the left or right. It’s all fairly standard stuff but that just helps the player get into the swing of things right away. If you’re a fan of retro shooters then you shouldn’t be passing Aqua Kitty up. Its retro visuals, combined with the slightly bonkers gameplay make it an excellent game to sit down with if you’ve got five minutes to spare, or even if you want to play something for an hour or two. 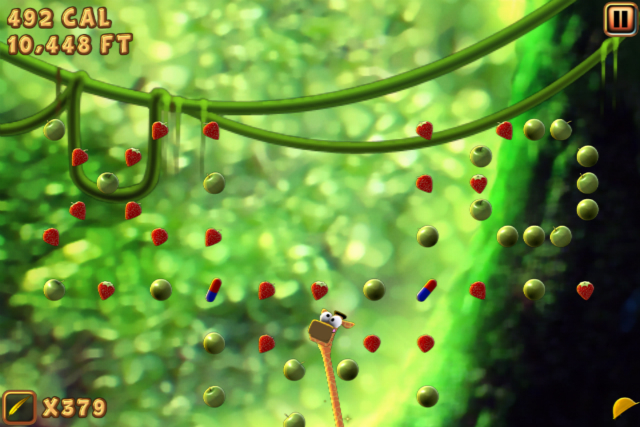 Considering how “twitchy” the gameplay gets in the later levels, I can imagine it being a little less fun on the Sony smartphones (except the Sony Xperia Play) simply due to a lack of physical controls. If you’ve got a PlayStation Vita then, for the paltry asking price, you’d be mad to pass it up. Go and save the milk! There is probably a circle of Hell reserved for particularly evil gamers, where they are forced to play Fuel Tiracas endlessly, and every time it beeps at them, some demonic overseer shaves off some skin or removes a finger or something. In its own product description it is described as a cross between plate-spinning and whack-a-mole, which is fairly accurate, only it’s actually some Hellish amalgam of both that seems designed to make you feel slow and rubbish. The concept behind it is that you are attempting to install an atmosphere processor on planet Tiracas and you need to mix different types (colours) of fuel to get the various nuclear reactors running. So you’re presented with 6 buttons – three on each side of the Vita’s screen – between which stand six gauges: pink, green, blue, orange, yellow and purple. Success is a simple (ha!) case of hitting each button the instant it lights up, which will add fuel to the corresponding gauge. Each gauge has a sweet spot and balancing the fuel level in this will pump power into the reactor. To succeed, you’ll need to balance all the active gauges, but they will deplete with every second that you’re not actively filling them. By level 8 it becomes a crazy frantic rush to balance each gauge and keep them optimised, where every moment spent on one colour will see the other colours drain. Over-fill them or let them run empty and you could cause a meltdown, which will end your game instantly. To mix it up and add to the challenge there are several different icons that may appear in a button and alter its effect. Skulls mean contamination and drain a chunk of fuel if you hit them, numerical figures require you to press the button the designated number of times, and little grey arrows indicate that you’ll have to hit the button they are pointing at, not the one that’s lit up. Sometimes you’ll need to press two at once, and special symbols will freeze either the timer or the gauges for a brief spell. At high speeds, Fuel Tiracas is hopelessly addictive and teeth-shatteringly frustrating in equal measure. Juggling all the gauges and memorising the button sequences (which are the same each time, handily) remains fun even when you’re pulling out clumps of hair in rage. The contrast of the bright, luminous-coloured fuel against the dark grey dashboard is visually pleasing, but not all that easy on the eyes when you’ve been staring at it unblinking for 8 minutes as you desperately try to claw your way up the online leaderboards. Overall, Fuel Tiracas is well-made, well-designed and good fun, even if it does come close to face-melting frustration at later levels. If there’s one thing I detested about Christmas as a child, it was the inevitability that if I had a stocking, it would likely contain one of those slide puzzles, where you move tiles around to make a picture. Decades have passed since that time, and my tolerance for slide puzzles has probably grown over the years; at least judging by my time with FuturLab’s Beats Slider. 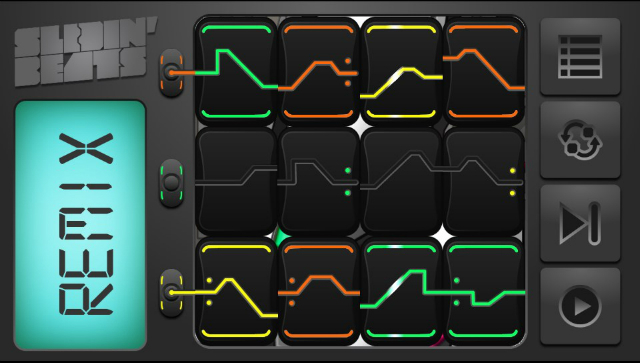 Beats Slider insists it is a rhythm-based puzzler, when in reality it’s a slide puzzle hiding in a trojan horse of slick graphics and pumping audio. Instead of piecing a picture together, you must match rows of sound waves to play the correct tune, with tiles lighting up once in the correct position. Completing the puzzle gives you a medal (if you finish it within a certain time) and allows you to play that level in Remix Mode, wherein you can place the tiles in any position you can think of, to make your own music. But it’s still a slide puzzle, and while Beats Slider did keep me amused enough to finish all of it’s puzzles; your enjoyment of the game is dictated by how much you enjoy sliding tiles around. However, for a mere 60p you can grab a simple puzzle game that tries something a little different. It’s also kind enough to give you hints for completing any sliding puzzle too, which I could have certainly used 20 years ago.